(Honolulu, HI)— When unique and delicious new flavors pair with delightful animal desserts, it’s a sure sign that the ever-popular Kulu Kulu Zoo by Kulu Kulu is back. This year’s line-up includes eight desserts spanning July and August with four sweets reveals each month. Peach Flamingo ($5.50): Pretty in pink and light as a feather, this mousse cake features crushed peach. Caramel Lion ($4.25): Filled with caramel cream, the Kulu Kulu signature cream puff earns its mane and joins the Kulu Kulu Zoo as an adorable lion king. Lemon Whale ($4.25): Whale, that was unexpected! Stuffed to the spout with lots of Lemon Custard Cream, the Double Cream Puff turns in to a perfectly round majestic aquatic mammal. Coconut Sheep ($4.95): The toasted coconut-flavored whipped cream made in-house topping this shortcake is enough to make anyone feel like their dancing on cloud nine. Banana Giraffe ($6.25): A giraffe print roll cake filled with banana cream is plenty cute. Top it with its own giraffe head-shaped cookie, and it’s automatically everyone’s new favorite dessert. Strawberry Crab ($3.95): Who says crab cakes have to be savory? Strawberry cream sandwiched by crab-shaped soft sponge cake is sure to be a favorite after-beach snack. Orange Tiger ($4.25): This stripe-and-whiskered cream puff with orange custard is an irresistible combination of creamy yet citrusy. Pine Coco Hedgehog ($4.25): With roasted coconut spikes and a pineapple custard cream, this is genuinely a hedgehog in paradise! 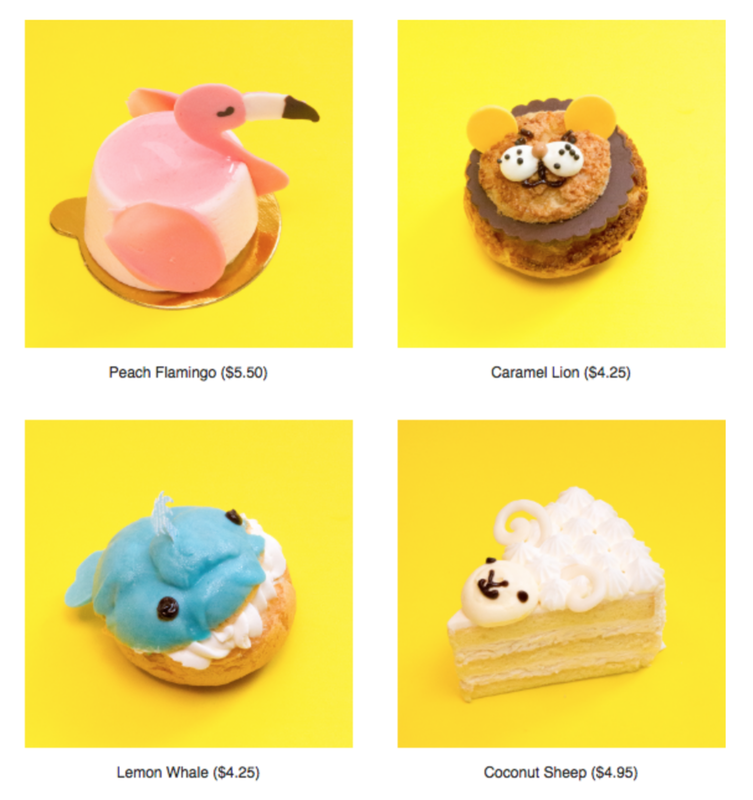 Kulu Kulu Zoo will be available at all Kulu Kulu locations now through August 31, 2018.These delectable sweets are ideal for themed parties, potlucks and “just because” treats all summer long. Kulu Kulu Cake is the proud recipient of the Honolulu Star-Advertiser people’s Choice award for Best Bakery in Honolulu. First opened at the old Shirokiya at Ala Moana Center in 2012, the brand has since become everyone’s go-to bakery for everything from after-school treats to weddings, and first birthdays to Instagram-worthy sweets in Waikiki. With three stores including two in Waikiki, the pastry shop is known for its delicious roll cakes, Diamond Head puffs, and signature cakes including Strawberry Shortcake, Chocolate, and Soufflé Cheesecake (to name a few).